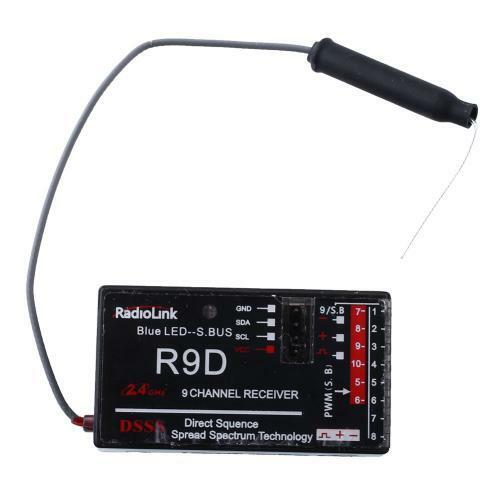 This R9D 2.4G 9ch receiver will work perfectly with RadioLink AT9 and AT10 Transmitter, please bind it before first use. 1. Please turn on your transmitter and select a memory slot. 2. Power on the aircraft, then Press and Hold the very small black button on the side of the receiver, until the LED goes flashing, then release the button. 3. After a few seconds it will automatically bind with the transmitter. How to swap between SBUS and PWM mode? 1. Make sure the receiver has already been bound to transmitter. 2. Double tap the very small black button on the side of the receiver (within 1 sec. ), then the LED light will change color, Blue is S.Bus, Red is PWM.